A variety of Polish flags are defined in current Polish national law, either through an act of parliament or a ministerial ordinance. Apart from the national flag, these are mostly military flags, used by one or all branches of the Polish Armed Forces, especially the Polish Navy. Other flags are flown by vessels of non-military uniformed services. 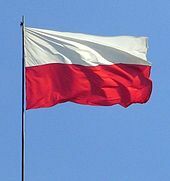 Most Polish flags feature white and red, the national colors of Poland. The national colors, officially adopted in 1831, are of heraldic origin and derive from the tinctures of the coats of arms of Poland and Lithuania. Additionally, some flags incorporate the white eagle of the Polish coat of arms, while other flags used by the Armed Forces incorporate military eagles, which are variants. Both variants of the national flag of Poland were officially adopted in 1919, shortly after Poland re-emerged as an independent state in the aftermath of World War I in 1918. Many Polish flags were adopted within the following three years. The designs of most of these flags have been modified only to adjust to the changes in the official rendering of the national coat of arms. Major modifications included a change in the stylization of the eagle from Neoclassicist to Baroque in 1927 and the removal of the crown from the eagle's head during the Communist rule from 1944 to 1990. Legal specification for the shades of the national colors has also changed with time. The shade of red was first legally specified as vermilion by a presidential decree of 13 December 1928. This verbal prescription was replaced with coordinates in the CIE 1976 color space by the Coat of Arms Act of 31 January 1980. The basic variant of the national flag is a plain white-and-red horizontal bicolor. A variant defaced with the coat of arms is restricted to official use abroad and at sea. Legal restrictions notwithstanding, the two variants are often treated as interchangeable in practice. Originally used only by the Navy, the use of these rank flags was extended in 2005 to all branches of the Armed Forces by an amendment to the relevant ministerial ordinance. They are flown to mark the presence and pay respect to the highest civilian and military authorities: the President of the Republic of Poland who is ex officio commander-in-chief of the Armed Forces; the Minister of National Defence who acts on the commander-in-chief's behalf in peacetime; Marshal of Poland, the highest rank in the Polish army (no living holders since 1989); and the Chief of the General Staff. Proportion 5:6 On Navy vessels when the President is on board. On land when the President is present. Proportion 5:8 On Navy vessels when the Minister is on board. On land when the Minister is present. Proportion 5:6 On Navy vessels when the Marshal is on board. On land when the Marshal is present. Proportion 5:6 On Navy vessels when the Chief of the General Staff is on board. On land when the Chief of the General Staff is present. Proportion 10:21 Ceremonial flag used on military holidays, visits of high civilian or military authorities, or representatives of foreign countries, as well as other ceremonies. Flown together with flags of other branches of the Armed Forces during Polish Armed Forces Day (15 August) ceremonies at the Tomb of the Unknown Soldier in Warsaw. The war ensign and the naval jack symbolize traditions of the Polish Navy dating back to Polish privateer fleet of the 15th–17th centuries. They are also symbols of a navy ship crew's courage, honor, unbreakable fighting spirit and readiness to defend Poland and its maritime rights. Naval Service Regulations define when, where and how the flags should be raised and lowered on board a navy ship. Special state service flags are used by state-employed civil special-purpose ships while on duty. These flags all follow the same basic design; a white flag with a horizontal stripe whose width is 1/5 of the flag's width. In the middle, each flag is emblazoned with the national coat of arms superimposed on a golden or yellow anchor whose height is 3/5 of the flag's width. The middle stripe is broken in the middle and does not touch the anchor or the arms. The type of special service performed by the ship is indicated by the color of the middle stripe. ^ Kromer, Adam. "Polskie flagi, chorągwie, bandery..." [Polish Flags, Banners, Ensigns...] (in Polish). Archived from the original on 2008-02-04. Retrieved 2008-02-02. ^ Znamierowski, Alfred (1995). Stworzony do chwały [Created for Glory] (in Polish). Warsaw: Editions Spotkania. p. 299. ISBN 83-7115-055-5. ^ "Historia Marynarki Wojennej RP" [History of the Polish Navy] (in Polish). Marynarka Wojenna RP. Retrieved 2007-11-10. ^ Koczorowski, Eugeniusz; Koziarski, Jerzy; Pluta, Ryszard (1972). Zwyczaje i ceremoniał morski [Maritime Customs and Ceremonies] (in Polish). Gdańsk: Wydawnictwo Morskie. p. 291. "Znaki Sił Zbrojnych RP. Odznaki tytułów honorowych oddziałów i pododdziałów wojskowych". Wortal Wojsko Polskie (in Polish). Miniterstwo Obrony Narodowej (Ministry of National Defence). "Poland". Flags of the World. This page was last edited on 14 October 2018, at 16:11 (UTC).